Tokyo Branch, Central Nippon Expressway Co., Ltd.; Asia Air Survey Co., Ltd.; Shin Nihon Giken Engineering Co., Ltd.; Joint Venture of OBAYASHI Corp., Showa Concrete, Inc. and HALTEC Corp.; Joint Venture of P.S. Mitsubishi Construction Co., Ltd. and Abe Nikko Kogyo Co., Ltd.; Mitsubishi Construction Co., Ltd.; Joint Venture of Kumagai Gumi Co., Ltd. and Honma Corp.; Joint Venture of Fujita Corp., ANDO Corp. and Taihei Kogyo Co., Ltd.
先行した下り線工事においては４主構としたが，その知見をもとに後発の上り線工事においては３主構を実現し，ＰＣ複合トラス構造を進化させた。 Both Sarutagawa Bridge and Tomoegawa Bridge are formed as PC composite truss structures, having total length of 1.2 km. 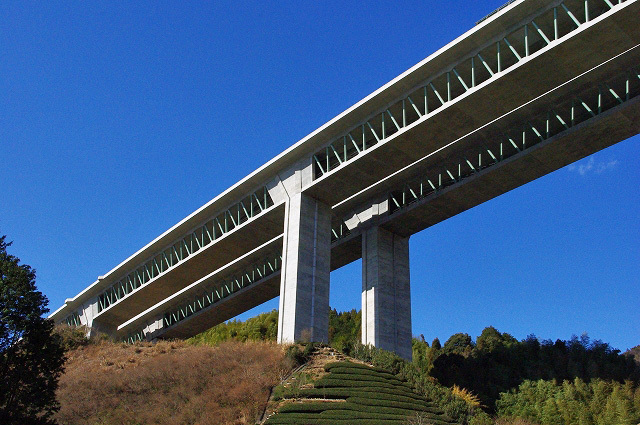 In order to accomplish the design concept of harmonization with the surrounding environment and of giving the impression of lightness in mass, the PC composite truss structure was adopted for the first time in Japan. The maximum span length is 119m which is the longest in the world among the same type of bridges. Joint portions of steel truss members to concrete slabs are deliberately designed having double tubes and double gusset plates. In the first construction of westbound of the bridges, the cross section consisted of four panels of truss. With the experience of westbound construction, the design of cross section of eastbound was progressed to realize the three panels of truss structure.